David Krut Projects is pleased to present My World, a solo exhibition by Senzo Shabangu opening on Saturday 3 October at 142 Jan Smuts Avenue. My World is Shabangu’s fourth exhibition with David Krut Projects and is comprised of drawings linocuts and unique works on paper that focuses on Shabangu’s journey of critical self-exploration. Themes tackled in the work include negotiation of control, the creative process and the ability to create and sustain – both from a practical and creative perspective. For Shabangu, the process of negotiating of control begins with identifying his position within a context. This context is explained by the triptych of three linocuts – Lord remind me who I am, Stand for yourself and Retrospective – that features as the centrepiece of the exhibition. All three works are introspective, revealing the artist’s deepest thoughts and feelings through self-portraiture. The imagery signifies three stages of individualisation for the artist, namely a prayer, the courage of conviction and the aspiration of what is to become. Emanating from this central triptych, the new body work is focused on the dynamics of the inner city, portraying Shabangu’s interactions with people and places that have an influence on his creative process and the negotiation of his position as a creative individual, with a career as an artist. The creation of these works as experiences contributes to his sense of control as he progresses into a more comfortable and sustainable position within the city of Johannesburg. Dominant tropes in Shabangu’s search for belonging are cardboard boxes and floating buildings. For the artist, constriction is found in day-to-day living experienced by everybody on different levels – confinement within such rigid boundaries is a source of concern and fear for Shabangu. The boxes are portrayed as floating, indicating a feeling of uncertainty in the absence of a tethering force. Since 2010 Shabangu has dealt with the complex, conflicted reality of coming from a small village in Driefontein in Mapumalanga and being confronted with the pressures of the city, as well as the emotional aspects of migration, which demands a change of perspective. Shabangu’s earlier works engaged with an unfamiliar city landscape and all its possibilities. 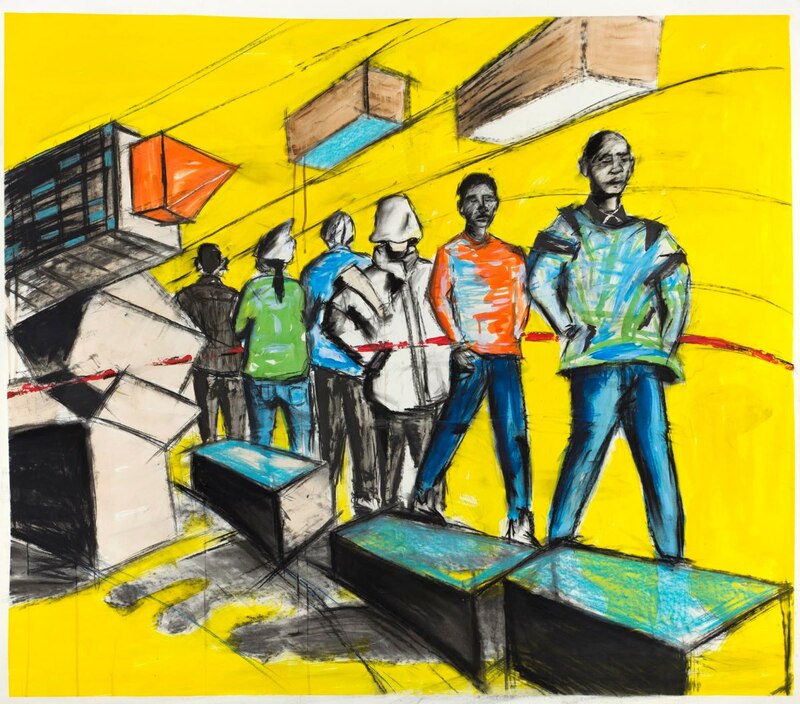 In this new body of work, Shabangu has shifted to an engagement with the intricacies that define the city from within. While earlier works portrayed the city skyline from a far, signifying a time when the artist was still emotionally removed from its inner workings, now buildings are identified individually through close up views and inspection that illustrates his deeper involvement and connection to Johannesburg. The exhibition runs from 3 October 2015 to 31 October 2015 at David Krut Projects, 142 Jan Smuts Avenue, Parkwood.